VOTE FOR THE WINNER OF "LATIN CODE WEEK" 2018! 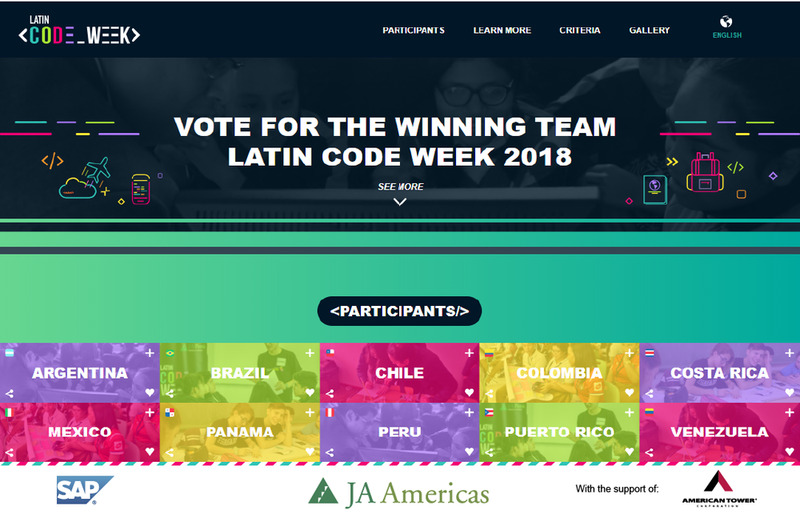 SAP and JA Americas´ digital literacy initiative Latin Code Week is concluding its third edition in Latin America, through an open voting process that will determine the winner of the 2018 edition among 10 projects finalists. SAP and JA Americas introduce the projects finalists of Latin Code Week, a program that motivates thousands of young students to start Science, Technology, Engineering and Mathematics (STEM) careers and consolidate as the workforce of the future. This initiative impacts nearly 3,000 youth, ages 16 to 24, from ten countries in the region: Argentina, Brazil, Chile, Colombia, Costa Rica, Mexico, Panama, Peru, Puerto Rico and Venezuela. Since the beginning of the program, 200 SAP and JA volunteers donated more than 15,500 volunteering hours. This year, Latin Code Week also counted on the participation of volunteers from the company American Tower. Each year, the program concludes with an Innovation Camp, where students develop their creativity and team-work skills for seeking solutions to a specific challenge in their communities, through the use of technology: They create Apps, getting closer to coding tools such as SAP Build. The theme of the 2018 edition was “Smart Cities”.